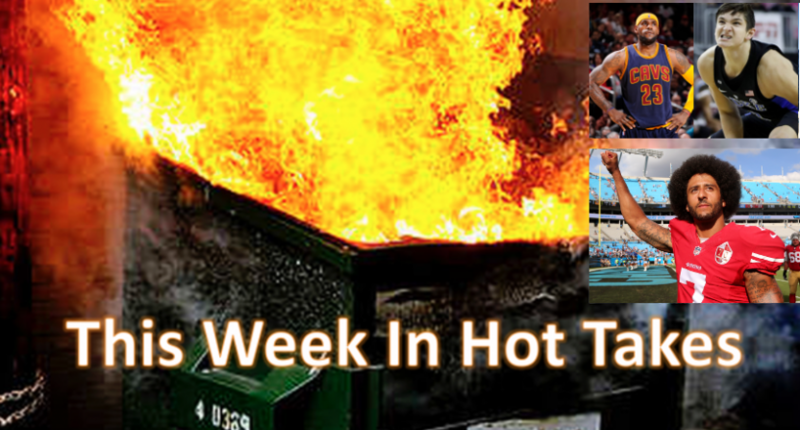 Welcome to another edition of This Week In Hot Takes. This time, we’re examining the hottest takes from sports media figures from March 17-23. Note: This column’s previous headline drew complaints and fifth hot take drew a wave of criticism. We’ve opted to change the headline and remove the offending take. First off, fining teams for doing this is one thing, but fining players is something else, especially as these decisions are theoretically made by the coaches and the organization. Players like James certainly have substantial influence on that, but they’re not (according to job descriptions, anyway) the ones making the call on who sits. Beyond that, it’s hardly a “dereliction of duty” for coaches and players to want to maximize their chances of winning the games that actually matter in the playoffs. But sure, try to take away players’ money for this. Duke is a better team than South Carolina, and nothing that happened on Sunday night changes that. South Carolina deserve every inch of credit for administering them a season-ending loss, of course, but the fact remains: Duke is one of the best teams in the tournament — if not the best — and when fans look back on 2017 in the months and years to come, they’ll remember it as little more than a missed opportunity. One of the best teams that didn’t even make the Sweet 16, perhaps. Kerr-Dineen is using an interesting definition of “best” and “better” here. But Duke has a problem, one that was especially amped-up this year because of Grayson Allen’s ongoing antics. In many ways, it was the reason its season came to a screeching halt on Sunday night. Duke were just too easy to hate. But as fun a dynamic as that creates for fans during the tournament, it presents a unique challenge for Duke players. It’s something the New England Patriots in the NFL and, indeed, other similarly ‘unlikable’ teams have to overcome in their respective sports. When you’re the team everybody loves to hate, every win becomes more difficult. Suddenly, teams that would otherwise have little motivation to do anything other than succumb are driving on effortlessly for victory, chasing the kind of glory South Carolina enjoyed on Sunday. When you antagonize your opponents simply by the nature of being who you are, you’re constantly having to rise to challenges just to stay in place. First off, not sure you want to cite the reigning Super Bowl champions as someone that struggles because other teams hate them. And “otherwise have little motivation to do anything other than succumb,” really? Yeah, everyone in this tournament doesn’t care about it at all unless they’re playing Duke. Advancing to the Sweet 16? That’s not important, unless you’re playing Duke. Right. Lovely twisted logic you have there. Ah, yes, take us back to the eras of Bill Russell’s Celtics, the Showtime Lakers, and Jordan’s Bulls, when there were just so many other contenders out there. “Super teams” have always been around in the NBA; some superstars electing to join others in free agency may be a bit new, but this isn’t a league historically known for its parity. Also, as mentioned with Smith above, blaming players for resting is also silly. Maybe look at the NBA schedule, and why certain scheduling quirks incentivize teams to rest their top players. Or look at why these coaches are opting to rest players. But sure, blame the players, who have just so, so much power in how this league operates. That’s why players’ share of basketball-related income has dropped from 57 per cent to around 50. Workplace betting pools, which flourish during college basketball’s March Madness competition and are perceived as a harmless way of boosting employee morale, should be dumped on the ash heap of business history. While we’re at it, let’s get rid of other collective on-the-job gambling campaigns, including employees pitching in to buy lottery tickets, running and betting on fantasy sports leagues or purchasing weekly football game squares, including the Super Bowl. …To me, workplace wagering is not all fun and games. Despite its growing popularity, a strong argument can be made that these betting schemes are disasters-in-waiting. They hinder employees’ productivity and are at best legally ambiguous. Also, many companies are ill-prepared for the larger liability and morale problems that can arise, especially if an in-house gambling gambit goes badly, such as harming someone struggling with a gambling addiction. Yep, workplace March Madness pools are “disasters-in-waiting.” Go Tronc yourself, Reed. Honorable mention: Mike Harrington for working “please like my sport” into his criticism of NBA players resting. Notable absences: Skip Bayless, Shannon Sharpe, Colin Cowherd, The New York Post. Some movement at the top, with Clay Travis working himself into a tie for first. Tune in next week for more This Week In Hot Takes. As always, you can send submissions to me via e-mail or on Twitter.